and yesterday they did it again - they held a regata. A boat race, if you need a better description. and eventually they're gonna race. But this was the race. The race of the year, the one for all the marbles. This was the Regata Storica. The festivities begin each year with a parade. There are all sorts of things to see on the water. as Venezia welcomed Queen Catherine of Cyprus. and can be rowed shows up to grace the waters of the Grand Canal. This year, as usual, the crowd was big. but mostly...they came to watch the races. a father was killed in an accident while trying to protect his family. gave all to save his children. but I have not felt qualified to weigh in on the who, how, or why. I believe Erla Zwingle has articulated it better than I ever could. "Nothing Romantic About Dying in Venice"
"Latest on the Gondola Disaster"
Regata Storica is a noisy affair. that noise really adds to the excitement. in honor of those who loved and lost him. 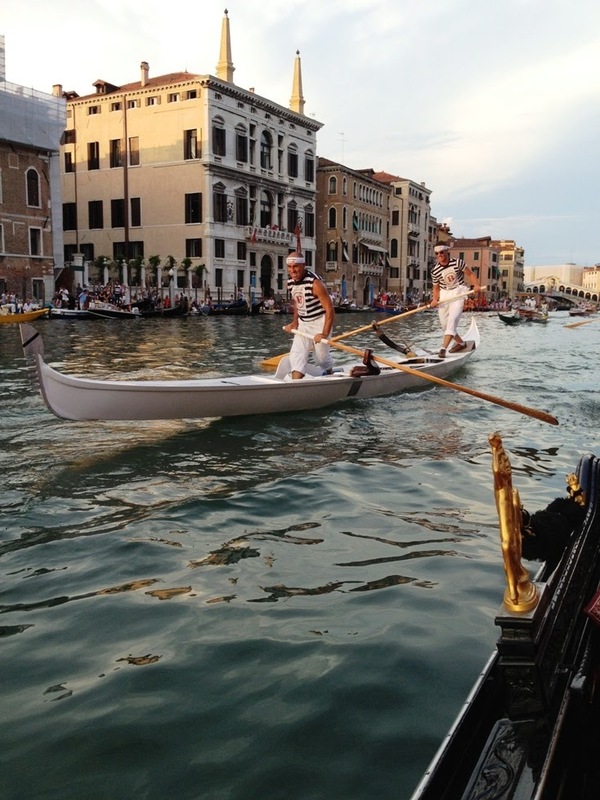 And since that awful event, gondoliers in Venice have marked the ferro blades on their boats with a black band. Even the racing boats carried such a marking. Some who were there for the Regata Storica this year described the moment of silence as overwhelming, surreal, and all were taken by the sheer solidarity of the gesture. gondolino is Maurizio "Sustin" Rossi, the son of Bepi Suste. The races were all exciting, but they always seem to save the best for last. The ultimate rowing race in Venice is the two-man gondolino event. These guys are the best of the best; they train all year for this competition. Sometimes it's a long collumn of gondolini, and you wonder if the guys in the leading boat can hold that lead, but this year there were some true neck-and-neck moments. 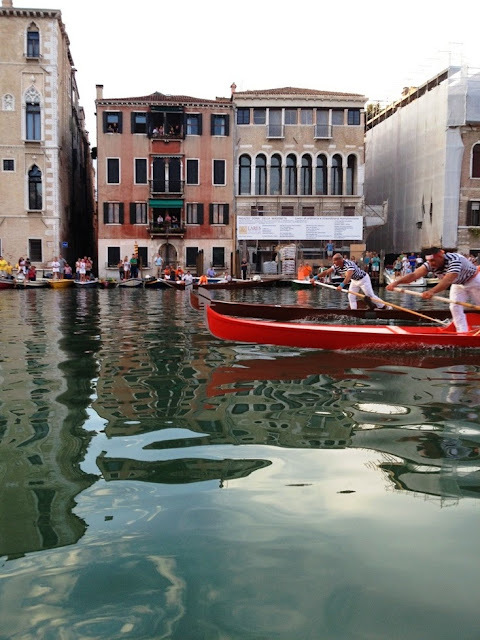 I was sitting on a gondola at San Beneto for the race with some gondoliers. It was superb! The boats were ripping by right next to us. Fantastico!! 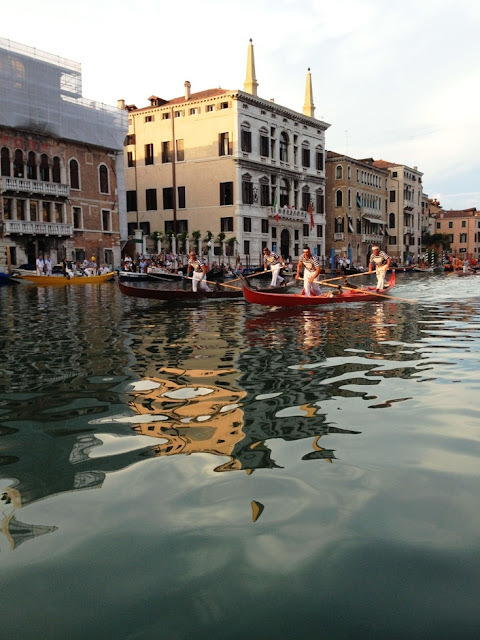 The gondolino is not just a stripped down gondola, she is a high speed balance-beam on the water. It only looks easy to row because the guys who race them make it look easy. No, they don't move as fast as Ferraris, but if you row...you know - that moving this fast over the water is a big deal. is the biggest deal in all of voga-alla-Veneta. row their hearts out in a race like this. This year there were two teams who were both absolutely determined to be the first over the line. Andrew was there as they went by, ferro-to-ferro. Understand that rowing these boats at this level of competition isn't just a simple matter of brute strength. It's a balancing act - make a wrong move and you'll end up in the water. Heck, row wrong and you can break an oar. Again, you're in the water, but this time holding part of an oar. What these guys do requires many disciplines. They are all worthy of recognition, and yet, there can only be one winning boat. This year, as it was last year, the winning team were the Vignottos - cousins from the island of Sant'Erasmo. My thanks go out to Andrew McHardy and Paolo Brandolisio. My congrats go to the Vignotto cugini, and all who earned a place in the race. Maybe next year I'll be lucky enough to be sitting in a boat as they race by.